It’s easy, when you’re learning about the Battle of Gettysburg—or any battle, for that matter—to get caught up in the tactics, the heroism. On Day 2 of the Alumni Association’s Civil War Study Tour, we got an important, moving reminder of war’s human cost. —163 buildings in town were turned into hospitals; there are still bloodstains visible on the floor of one church. —7,000 soldiers were killed and needed to be buried. —5,000 horses were killed, too, and they couldn’t be buried. They were burned. Imagine the stench. More people died at Gettysburg than during the D-Day invasion. Total during the Civil War, there were 623,000 deaths (some historians think that number should be higher), which was 2 percent of the U.S. population. If you extrapolate that number to Vietnam, Williams said, there would not be 58,000 names on the wall, but instead 4 million. As one of our faculty leaders, Terry Winschel ’77, has said a couple of times: There was not a family in America that wasn’t personally affected by the Civil War. We learned many more of their stories on Friday. Chamberlain’s unit was the left flank on the afternoon of July 2, 1863, the end of the Union line at Little Round Top. He was ordered to hold it “at all hazards,” which is essentially a fight to the death. His unit, like many others, was depleted, although bolstered with the arrival of troops from another Maine unit—prisoners—whom he talked into fighting with him. They fought bravely but ran out of ammunition, and at the moment of truth, Chamberlain ordered a bayonet charge, which drove off the Confederates. It was a key moment in the battle, and Chamberlain went on to be wounded six times, become a decorated general, then the governor of Maine, then the president of Bowdoin. It’s a terrific story, although the opinion of many on this trip is that Chamberlain gets so much credit because he was, essentially, a good promoter, and educated enough to write his story well. If only I’d been shooting video. Words alone aren’t really doing it justice. As Terry said, “He has that voice of authority, does he not?” I guess that’s how generals get their troops to perform, through discipline and force of personality. I’m the biggest wimp in the world, but had there been a bayonet anywhere around me after Parker’s order, I’d have fixed it. Anyway, Friday morning’s Clausewitz quote was about boldness, which he called “the noblest of virtues, the true steel which gives the weapon its edge and brilliancy.” Chamberlain, no doubt, exhibited that boldness. But so did Gen. George Greene, better known as “Pop” and a particular favorite of many on this trip. Green was 62 years old—“dag-gum old to be a soldier,” Parker said, and oldest general on the field—and an engineer. His 12th Corp brigade was ordered to hold Culp’s Hill, a key strategic high ground just east of the Union line at Cemetery Hill, so Greene spent his time fortifying his position by building breastworks. Although another general, John Geary (as in Geary Hall) mocked him, saying that “real soldiers don’t dig in,” Pop Greene paid him no mind. When the Confederate attack came the evening of July 2, Greene’s men were ready. Although their ranks had been depleted, sent to help elsewhere on the battlefield, the Union soldiers held the hill—thanks in large part to Greene’s breastworks, which protected them and gave them cover to fire. Chamberlain is celebrated—deservedly, everyone stresses—for holding off a only a regiment and a half. Pops Greene helped to hold off five to seven regiments. In the dark. I loved these stories. But Williams’ presentation stayed with me the whole day. It was so important, in all this discussion of battle tactics and leadership principles (and lack thereof), to remember the real human cost. It was also the first time I’d really considered the difference between “killed” and “mortally wounded,” and as we toured the battlefield Friday afternoon, listening as Terry and Parker brought the soldiers and generals alive, I realized how much worse it was to have been mortally wounded. Some of these guys remained alive for hours, in agony. Yet some were still coherent enough to leave behind truly memorable last words. Gen. William Barksdale of Mississippi, wounded while advancing across the Peach Orchard on July 2, spoke his final words: “Tell my sons my last day of duty was well done.” Col. Isaac Avery of North Carolina, shot in the neck the evening of July 2 as his unit attached Cemetery Hill, pulled out a piece of paper and a stub of pencil and scrawled, “Major: Tell my father I died with my face to the enemy.” The note is at the North Carolina State Archives. It’s covered in blood. Entry filed under: Alumni Association. 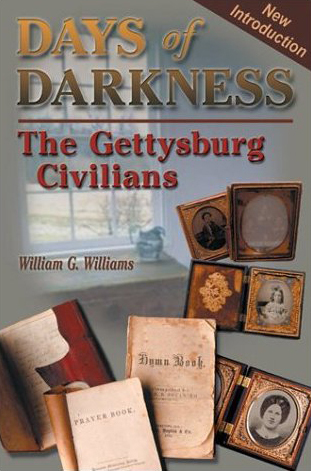 Tags: Gettysburg, Joshua Chamberlain, Parker Hills, Pops Greene, Terry Winschel, The Killer Angels, William Williams.